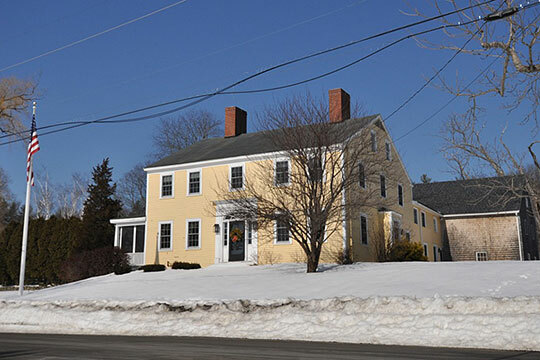 South Hampton Town Hall is located at 3 Hilldale Avenue, South Hampton NH 03827; phone: 603-394-7696. Photo: Home on Highland Road, ca. 1820, South Hampton, NH. Photographed by User:Magicpiano (own work), 2013, [cc-by-4.0 (creativecommons.org/licenses/by-sa/4.0/deed.en)], via Wikimedia Commons, accessed February, 2015. European settlement in the South Hampton area dates to the mid-17th century. Originally a western extension of Salisbury, Massachusetts, those lands lying west of the Pow Wow River became part of Amesbury, Massachusetts following Amesbury's incorporation in 1666. Jewell Town, Currierville, Highland Road, and the South Hampton Town Center were the first areas to attract settlers the majority of whom were subsistence farmers migrating north from present day Massachusetts. The location of the Pow Wow River was a key factor in influencing initial settlement patterns. Mills, drawing power from the river, developed along the river banks. Mill operation, combined with farming, formed the cornerstones of South Hampton's economy through the nineteenth century. Early eighteenth century border disputes between Massachusetts arid New Hampshire were resolved in 1741 with the adoption of the Mitchell Line as the permanent boundary between the two colonies. With this settlement, present day South Hampton fell under the jurisdiction of New Hampshire. The area was subsequently incorporated as a town on May 25, 1742. The pre-Civil War years were South Hampton's most prosperous. Industrialization was reflected by a growing number of small industries. By 1840, a total of 22 small manufacturers and tradesmen were active in the town. In addition to blacksmith shops, small shoe shops and mills operating along the Pow Wow River, manufactories were established to produce such varied products as pails, umbrella handles, matches, and parts for carriage factories in Amesbury; a town emerging as a national and international center for carriage manufacturing; Road improvements coupled with increased traveling throughout New Hampshire and northern Massachusetts. Service industries, including taverns, blacksmiths and wheelrights, prospered in the Smith's Corner area as an extension of the stage trade. By 1850, sixty-four farms averaging sixty acres in size were operating in South Hampton. Major products included corn, potatoes, hay, butter, and cheese. Orchard crops were produced by one-half of the farms surveyed in 1850. Orchard production increased in importance until, the Civil War. Lynne E. Monroe, Kathryn Kuranda and Woodward Openo, Rockingham Planning Commission, South Hampton Multiple Resource Area, South Hampton, NH, nomination document, 1982, National Park Service, National Register of Historic Places, Washington, D.C.